Aloe Vera and Glyconutrient Products in the World! Click Here for info about our 2 for 1 special offer and other great deals! IN MAY OF 1995 I BELIEVED I WAS GOING TO DIE. I WAS SO SICK THAT EVERY LIVING MOMENT WAS AN AGONY. I HAD NO IDEA THAT I WAS ACTUALLY ABOUT TO UNDERGO A POWERFUL AND UNFORGETTABLE EXPERIENCE. I had been ill for three years, ever since a trip to India where even bottled water is unsafe to drink. Over time my immune system literally crashed. I developed many different health issues. I developed dizziness, lumps in my throat, joint pain, a build up of yeast in my body and gastrointestinal difficulties. I left Manhattan for Hood River, Oregon, but even in a setting of sylvan beauty my health continued to deteriorate. A holistic doctor in Toronto gave me almost every alternative approach in the book. Nothing had any significant impact. My wife suspended her Manhattan practice to fly out to Oregon and put me on a diet of raw vegetables and fresh juices. It helped my joint pain, but other symptoms raged on. My life funneled down to one single pleasure: sleep. One day my wife and I drove to a bookstore in Portland, where I came across some information about David Hudson, an unusual lay scientist who had formulated a truly wild premise: that in the periodic table there were actually elements that consisted of a single atom per molecule. He called them monatomic elements. According to scientific literature cited by Mr. Hudson, these elements could actually generate photons of light, and within the body this transmission of light might allow for greater health to be created in every cell and the body as a whole. Communication between cells occurs on more than just a chemical level according to Hudson, with the photon level important for activating immune system cells to function correctly. At a laboratory in Arizona, Hudson had been working with a world famous metallurgist, Dr. Sicafoose, who had found these elements existed in high concentration in certain plants. Aloe Vera was one of those plants. According to Hudson, the complex sugar molecule (called mucopolysaccharide, or MPS) in Aloe contained monatomic elements. It turned out that MPS had been isolated from Aloe, and extracted and dried as a powder extract utilizing a proprietary method. More specifically, MPS is a specific molecule called the galactomannan that is a combination of galactose and mannose in long linear chains. This extract contains 60% of the pure MPS and 40% other natural Aloe ingredients, which has been authorized by the FDA to be sold as a nutritional supplement. As I learned more about he active ingredients in Aloe Vera, I came to understand the vast array of mainstream research regarding the MPS molecule (galactomannans) that validates their profound health properties for a wide range of issues. More recently, the term "Glyconutrient" has been used to describe these active ingredients in terms of their role to facilitate more coherent and effective communication between immune system cells and all cells in the body. At the time of my health issue, I had nothing to lose. I bought the powder. Within twenty minutes of my first dose I felt a profound and incredible change. I felt a wave of ease and vitality flow through my entire body. I could feel this sensation flow down my arms and legs and into my thymus gland and heart area. I could actually feel the health changes in my cells taking place, which was surprising to say the least! Within three days of taking the supplement, I was feeling so much better that I was actually able to go swimming in a river and hike a few miles with my wife. For five months I took a high dose of one teaspoon a day, and then I dropped to a maintenance dose of a quarter teaspoon daily. I regained my health! I could hardly believe I had stumbled upon the answer to my health crisis. According to Iran Danhoff, M.D., Ph.D., a world expert on this plant, Aloe Vera contains different health properties based on the length of the MPS molecule. The size of the MPS molecules in Aloe Vera corresponds to their weight, which is measured in Daltons. According to Danhoff, the molecular weight ranges for MPS is from 10,000 Daltons up to 2,500,000 Daltons, with may different health benefits depending on the molecular weight, which includes powerful anti oxidant and free radical scavenging health effects. Without this complete range of molecular weights stabilized in an Aloe Vera gel extract, there are very little if any health benefits. Stabilizing a complete molecular weight range from Aloe Vera has not been possible until recently and is responsible for making the product that I took that was so effective. As it turns out, the only product with published molecular weight analysis that represents fresh gel from the Aloe Vera plant is MPS GOLD™ 100, which is my personal formulation. MPS GOLD™ 100 is also the most scientifically validated Glyconutrient product, bar none. My company Health Breakthroughs International, LLC has developed a proprietary manufacturing process to produce MPS GOLD™ 100 and its new complimentary product MPS GOLD™ 3X. Because my company is not involved in network marketing but only direct sales, the concentration of the active ingredients can stay very high and the price can stay very low. 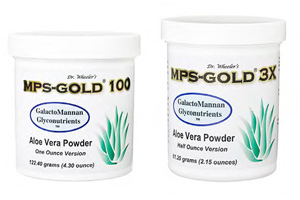 MPS GOLD™ products are mostly tasteless and odorless, unlike any other Aloe Vera and Glyconutrient supplements. MPS-GOLD™ products are the most advanced Aloe Vera and Glyconutrient products in the world today, and contains the full range of MPS molecules. It takes 8 gallons of Aloe gel to make just one ounce of the MPS GOLD™ 100 and MPS GOLD™ 3X proprietary process dried powder! Until recently, this type of powder product could only be purchased through multi-level, network marketing. Now MPS-GOLD™ products are available at up to 90% off the prices not only for MLM versions but also the newer Aloe and Glyconutrient products that are highly diluted in comparison! Eventually, I developed a booster Aloe Vera product, which is taken along with MPS GOLD™ 100. This product is called MPS GOLD™ 3X and has been proven to increase the overall immune system response along with MPS GOLD™ 100 by up to three times! The range in dosage for taking MPS GOLD™ 100 is from one half up to two and half level measuring teaspoons a day, first thing in the morning mixed with a few ounces of water. For health maintenance, the half a teaspoon a day dose is enough. For the most serious health concerns, take up to two and half teaspoons a day. Mix half the amount of MPS GOLD™ 3X with whatever the dose of MPS GOLD™ 100 is being used. Click Here to read why MPS GOLD 100 is the least expensive glyconutrient product. As it turns out, MPS GOLD™ 100 is not only the best Aloe Vera product to bolster and balance the immune system, it is also the best Glyconutrient product. The term Glyconutrient has become popularized with glyco meaning sweet and nutrient that is something useful to the body. Therefore, the active ingredients in MPS GOLD™ 100 and its booster companion product MPS GOLD™ 3X are considered sugar molecules in their simplified form and carbohydrates in their complex naturally occurring form. Even though Glyconutrients are considered sugar molecules, they are not sugars that are metabolized for energy as is the case with glucose. Glyconutrients do not negatively alter blood sugar levels for this reason, and actually may balance blood sugar because of their beneficial effect on different blood sugar mechanisms in the body. The role that Glyconutrients play in the body goes way beyond just immune system considerations, which is about the far reaching implications of cell to cell communication, and even newer research indicating stem cell growth to regenerate new tissue. The fact that MPS GOLD™ 100 is the best Glyconutrient product in the world explains why so many different effects can take place, such as profound changes in the brain and nervous system overall. I have seen health changes for so many conditions that it would be hard to list them all, and this all comes back to the fact that MPS GOLD™ 100 positively effects every cell, organ, gland and system in the body. The active ingredients in MPS GOLD™ 100 -- mannose and galactose -- are the most important of all the different Glyconutrients. In fact, these two Glyconutrients act as the commander in chief for all immune system and cell to communication processes. Based on real scientific evidence, there is absolutely no validity whatsoever when it comes to the so called eight essential sugar theory that many companies tout in selling their Glyconutrient products. The bottom line is that the more you increase the level of other plant sugars in a Glyconutrient product other than Aloe Vera galactomannans, the more real health properties are diminished. Currently, there are a number of doctors and other health professionals who use MPS GOLD™ products as well as many of my other products. The healing results achieved in many different types of practices may seem amazing, and even impossible according to what is seen with both mainstream and many alternative health approaches. A reasonable approach to comparing MPS GOLD™ 100 and its companion 3X product to other Aloe Vera and or Glyconutrient products is based on both the clinical observations made by doctors in terms of the health effects that takes place with patients and hard scientific evidence. The evidence is overwhelming that MPS GOLD™ products are far superior in comparison to all other Aloe Vera, Immune System and Glyconutrient products! Click Here to view what some of these healthcare professionals are saying about MPS GOLD™ and our other products. I am very accessible by both email and telephone. If you would like to discuss your health issues and my products, please feel free to contact me. By telephone, please call toll free in the USA at 888-342-6772 and international at 503-526-9130. By email contact me at wheeleroffice@aol.com. Both the shopping cart and product price list is accessible from the navigation bar at the top and bottom of the page. Click Here for the product price list. Click Here for the shopping cart to order with a credit card. You can also order by telephone: toll free in the USA at 888-342-6772 and international at 503-526-9130. "After using MPS-GOLD™ for myself, I began using it with my patients. I have found MPS-GOLD™ useful in my practice in several ways to support both mainstream and complimentary medicine. Marilyn states, "I started taking the MPS-GOLD™, Oat Beta Glucan 1000™ and Immune Revitalizer for chronic diarrhea. Within a few weeks on David Wheeler’s products, my diarrhea was totally resolved. I then had my husband take the same supplements, plus the Power Herbal Formula™. After three weeks he reported that he was doing much better." Dr. David Wheeler was born in the very small town of Glasgow, Montana. After Dr. Wheeler's family moved to the Seattle area for a few years they eventually made their permanent home in Oregon, where his mother still resides in the same house to this day in the Portland area.